DFRduino M0 Audio Expansion Shield selects the latest full-featured WM8978 of Wolfson as the audio processor. It comes with HI-FI level digital signal processing kernel, supporting 3D surround-sound enhancement and 5 frequency bands balance which can improve the sound quality. With a programmable notch filter, it also can filter noise caused by current noise, etc. Attributing to the plentiful hardware resource on DFRduino M0, we finally can transplant this HI-FI level codec chip to Arduino platform. Functions like dual channels playing, SD card storage, MONO recording and dual channels 3W PA (power amplification) are available even without serial port MP3 module. It is efficient in serial port resources, flexible in control and convenient to use. 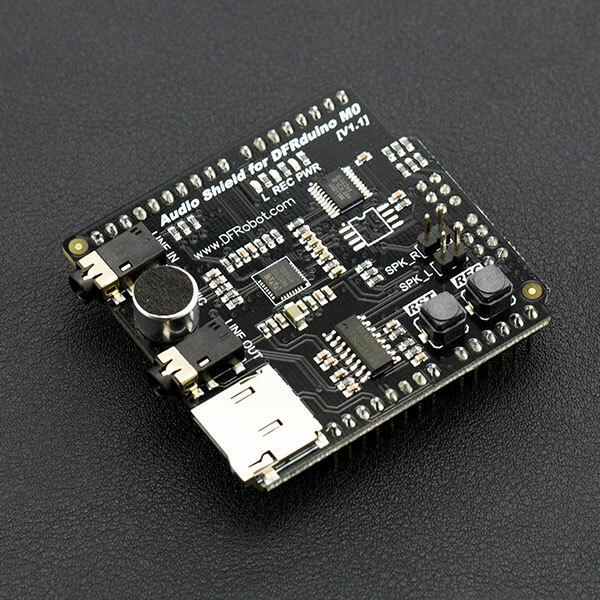 DFRduino M0 Audio Expansion Shield adopts standard IIS interface, equipped with on-board MIC and 3.5mm audio jack, supporting external voice source input and output. It also has left and right channels speakers, which you can connect 3W trumpets. NOTE: DFRduino M0 Audio Expansion Shield uses IIS interface and it is only compatible with DFRduino M0 and Bluno M0 microconyrollers, not support common Arduino microcontrollers. Dimension: 55mm * 53mm/2.16" * 2.08"
In this section, we'll display 2 examples: Play WAV music & Record your voice. MicroSD card with FAT format (Currently, exFAT is not supported. Please use FAT16 or FAT32 for formatting). Upload the sample code, open the serial port monitor, and it will play themusic. Record the voice for 5 seconds. 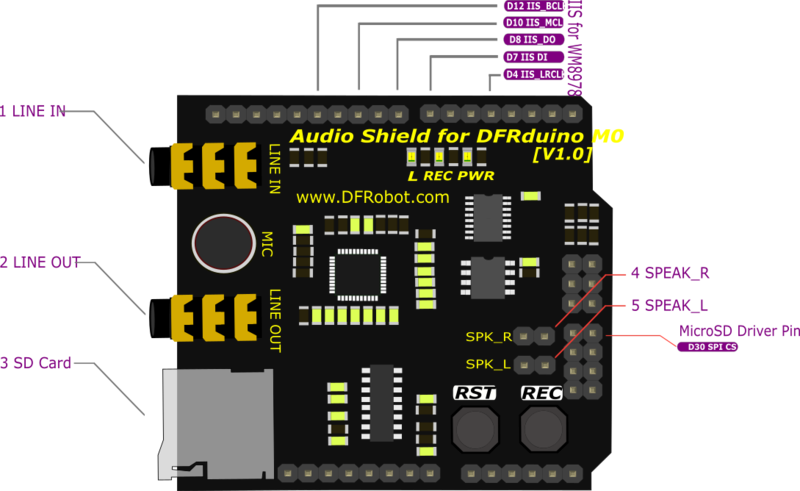 Get [link Audio Shield For DFRduino M0] from DFRobot Store or DFRobot Distributor.